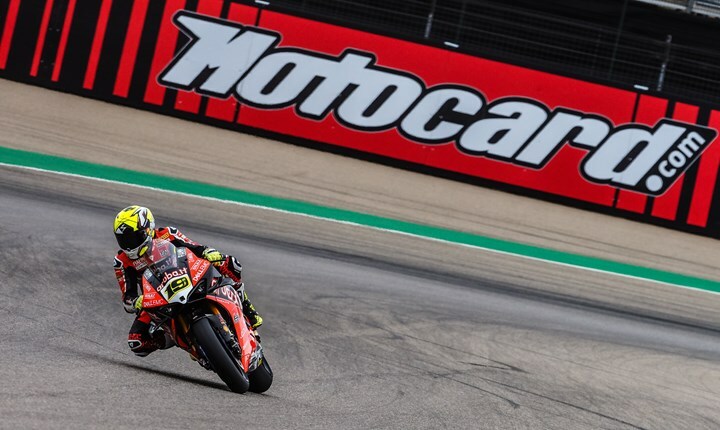 The WorldSBK field will return to action at the Motorland Aragon circuit this weekend with all riders out to finally put one over on Alvaro Bautista, who has stolen a march on his rivals so far this season. The Spanish series newcomer is unbeaten after his first six races in the series, the first rider to achieve such a feat in World Superbike history. The Ducati man's nearest challenger is four-time champion Jonathan Rea, who has finished in second place in all six races so far for Kawasaki. But it's been Alex Lowes who has been Bautista's nearest challenger so far at Aragon. Lowes was second in both practice sessions in Spain today (Friday) and halved the deficit in the second practice. Rea could only manage the third quickest time, and suffered a few issues as well with his team having to dismantle the bike halfway through the session, but was only half a second away from Bautista's pace. BMW's Tom Sykes posted the fourth fastest time, under a tenth away from Rea, while Eugene Laverty and Sandro Cortese completed the top six. The first race of the weekend takes place tomorrow, with the Superpole race and then the final encounter following on Sunday.